Included below are homes for sale in Bankers Hill San Diego. If you would like more information on any of these Bankers Hill real estate listings, just click the "Request More Information" button when viewing the details of that property. We can provide you with disclosures, past sales history, dates and prices of homes recently sold nearby, and more. And, if you haven't already, be sure to register for a free account so that you can receive email alerts whenever new Bankers Hill condo listings come on the market. When searching for homes for sale in Bankers Hill San Diego you will find only 2 or 3 single family homes trade each year. Bankers Hill is an upscale San Diego neighborhood near Balboa Park also known as Park West. Bankers Hill is bordered to the north by Hillcrest (at Upas St.), to the south, past Date Street, by Downtown (at Interstate 5, the San Diego Freeway), to the east by Balboa Park, and the west by Interstate 5, Little Italy and the neighborhood known as Midtown. Bankers Hill is also referred to as Park West. Luxury condominiums face the park or are elevated offering panoramic views of Downtown, San Diego Bay, the airport, Coronado, Harbor Island and Mount Soledad. Many homes are historic originating from the late 19th century, including some which have been restored as offices or bed-and-breakfast inns. Architects Irving Gill, William Hebbard, Richard Requa, and Frank Mead designed homes in Bankers Hill. Bankers Hill luxury condo buildings include Park Royal, Laurel Villas, Brittany Tower, Parke Ivy, and The Lodge. Park Laurel is a fourteen story ninety nine unit full concierge luxury high rise adjacent to Balboa Park in Bankers Hill. Park Laurel was developed by CLB Partners, Ltd. in two phases, phase one North Tower forty eight residences was completed in the fall of 2003, phase two South Tower fifty one residences in the fall of 2005. There are seven townhomes, and eight penthouses the 13th and 14th floor in both towers. Park Laurel was designed by Austin Veum Robbins Partners with luxury community amenities second story sun deck offering a pool, spa, with a furnished pool side lounge with outdoor barbecue, kitchen and club room, library, fitness room, 24-hour security, and concierge. Cypress Hills is a gated thirty four unit townhome community just a few blocks from historic Balboa Park and Little Italy. Bayvu is four story forty unit condominium complex with community pool atop San Diego’s Bankers Hill at 2414 Front Street. Brittany Tower is a ten story fifty two unit condominium complex at 230 W Laurel Street in Bankers Hill. Brittany Tower amenities include pool, sauna, spa, fitness center, BBQ area, and community room. Laurel Bay is a four story one hundred condominium with community pool in Park West atop Bankers Hill. The Bellefontaine is a twelve story thirty unit luxury condominium complex developed in the early 1970’s by Doug Manchester. 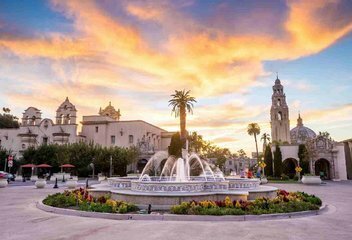 The Bellefontaine is atop Bankers Hill overlooking Balboa Park and the San Diego Harbor at 2400 Sixth Avenue San Diego, California. The Bellefontaine amenities include twelfth floor private club for consisting of a media center, kitchen, and meeting room suitable for formal occasions. There is also a gym and sauna on the twelfth floor. The Lodge is a three story six unit complex built in 2006. Bankers Hill also known as Park West is a San Diego neighborhood bordered by Mission Hills and Hillcrest to the north, by Date Street Downtown to the south, at Interstate 5, Midown, and Balboa Park to the east. It was named “Bankers Hill” because many affluent attorneys, doctors, and lawyers, held residences here dating back to the 1890’s. Many of the historic mansions on Bankers Hill were designed by notable architects Irving Gill, William Hebbard, Richard Requa, and Frank Mead. Many of these Victorian mansions have been restored into business offices, bed and breakfast inns, and private residences. Banker’s Hill real estate have southwest elevated panoramic views of San Diego’s downtown area, the San Diego Bay, airport, Harbor Island, and Mount Soledad. Park facing condominium developments have been built up along 6th Avenue facing the park. Maple Street Rowhomes have no HOA’s. It is a three story six unit rowhome complex built in 2002. Century Plaza Towers located at 3535 1st Avenue in Bankers Hill is a sixteen story fifty two unit condominium high rise. Marston Point Court Homes is a sixteen unit contemporary rowhome community in Bankers Hill just steps away from Balboa Park. Park at Sixth is a five story thirty seven unit mid-century modern condominium community in the highly sought after Park West community and directly across the street from San Diego’s Balboa Park. The Park Bankers Hill is a thirteen story sixty unit ultra luxury glass condominium tower overlooking Balboa Park at 2850 6th Ave in San Diego, CA 92103. The amenities at this modern residence community include front desk concierge, yoga and fitness studio, wine storage room, and guest suites. The community outdoor pool deck will have fire pits and resort sized pool.